Please share your memories of growing up including Grade and High School. Email them to Doug Woodring or Bob Brewster [Click on Name] and we will post them on this site. If you prefer, send them the old fashioned snail mail way to Doug. If you send pictures, Doug will scan them and send them back. If you like reading about our classmates' memories, then send yours, since they would like to read about yours too!!! 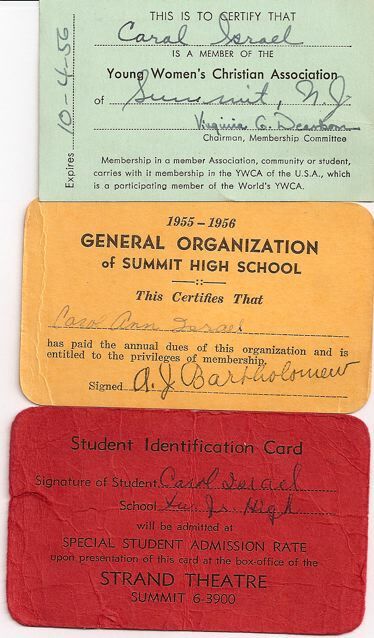 Growing up in Summit was great. When we lived on Colt Road we kids would get together for baseball games and soccerball in the middle of the street; tennis on the Reeds’ court; put on a circus on Jerry Ball’s trapeze and rings; swing from a rope behind the Ludlow house over a canyon on Windsor Road; and pretending that we had poured sand into the gas line of a visiting car outside the Wente home by leaving a pile on the road and then getting caught hiding behind a tree when the owner of the car came out! During snowstorms our mothers got Warwick Road, along the side of Franklin School, closed to traffic and they would be at the top and bottom watching over us. We would ski down the hill overlooking Franklin School, until Billy Kirk’s parents built their home at the top, after moving off Colt Road. I attended the Esther Ann Nursery School on Kent Place Blvd. And then Franklin all the way through 4th grade with Mrs. Brooks. She drilled and drilled us on all the math tables and to this day I’m still able to “spit” them out. Jenifer Tatlock and I were never allowed on the same teams I guess because we were the “toughest”!! Remember Miss Howard and Mr. Underwood? I don’t know what happened to her but Mr. Underwood taught me Behind the Wheel in high school. Carol Israel would invite girls out to her grandfather’s home I Peapack/Gladstone. We rode the train back one day and as I got off the train my parents were shocked to see that my blonde hair had turned green! Apparently, something called Bluestone was put in the pool water for color. We moved over to the Brayton School area where I attended 5th and 6th grades. Ann Griswold and I were best of friends. I lived behind her home. I was in Miss Dunnells class. It seems that we went through stages in that school. Marbles, Royal Gelatin (because it was sweeter than Jell-O) poured out in our desks and we’d dip our fingers in it during class. I remember the day Donald Marcy loaded a spitball on a ruler and it hit Miss Dunnells on the forehead! In the 6th grade we moved again but still remained in the Brayton area. I remember riding my bike and roller-skating to school down Ashland Road, something you would never dare to do today! After school a bunch of the girls would go over to Memorial Field and I believe we had to follow the leader to be in a club or something. Well, when we got to laughing you know what happened to one of us and I will not mention the name. Those involved should remember! If you don’t know I won’t tell. 7th through 12th was just one big blur with the exception of those terrible, smelly gym suits. Miss Moody's temper tantrum in my 5th grade class at Franklin School. She was so out of control that she picked up her chair and banged it up and down screaming at the class and some very unlucky soul. Does anyone else remember that awful scene? I rode my bike all over Summit until I got my driver's license. Considering I lived almost in New Providence, I did a lot of biking. I remember those hills although I think of most of Summit as flat or gently slooping. I remember Lafayette Grimsby came to talk to my 8th Grade class. He was a SHS graduate, perhaps from the class of '52 who kept in touch with our teacher, Mrs. Hughes. He was a Russian linguist working at the Library of Congress. That year was 1953. I had never met anyone before who spoke Russian. It is a good memory that has stayed with me since. I remember the clothes we wore. It fascinates me to this day that those fashions cycle in and out of vogue. You can still buy shirtwaist dresses and sweater sets and of course, pearls. But girls are not wearing their sweaters buttoned backwards, or those Peter Pan collars. I remember watching movies at the Strand, my mother buying meats at Caruso's, Trost's bakery -- yum, buying clothes at Frumkin's, taking the Summit bus to school and of course the wonderful Saturday afternoons watching football at Memorial Field. I went to a private school before 7th grade, so came there knowing nobody and totally intimidated by the sheer size of the school...as compared to the one I was used to, of course. I remember our whole 7th grade English and Social Studies class...Mrs. Doty's, I think...and we had some poor beknighted substitute that day and our whole class conspired to slam our books shut when the clock hit 2:40....Oh my, that poor woman...she must have jumped 4 feet in the air! I also remember that SOMEBODY(naughtynaughty), put Limburger cheese in one of the heating ducts...or something that smelled like Limburger, and the stink was unholy!Wheeweeeeee. It was one of the Older Boys....they were so funny...and older. For Pete is good on his feet. And we know that he can make it. Think of someone who is almost 70 with THAT little ditty stuck in her mind! I remember being frozen to my chair while Jean McVean gave me the evil eye for not having memorized my Latin declension...I remember having trouble staying awake in Mrs. Dingee's math class, which was right after lunch. Watching "the yawn" travel around the room was better than learning fwacshuns...and at least one person also drooled while yawning, adding to the entertainment, of the kind only a 13 year old could appreciate. Math classes were clearly a problem with me...Algebra defied me, and Happy Harry Dampman kept me on the edge of my seat, again with entertainment only an adolescent could get near. Mr. Dampman's skill with a ruler-as-scratcher kept me spellbound and made me wonder how anyone could concentrate on Plane Geometry while he stood at the front of the room with the ruler down his pants, scratching away. Thank heavens for summer school far from Summit, with a non-itchy teacher. I loved English classes with Mr. Dederick, and World History with Miss Steele, and Biology with Miss White. Occasionally something smells enough like formaldehyde to instantly jerk me back to a dead frog on my desk, a dull dissecting knife in my hand, and the dread of making that first cut. I remember having to throw my containter of milk out in the spring because the cows had been grazing on onion grass...yechhhh....and those great ice cream cups with pictures of the less well known movie stars on the inside of the lids. It was considered quite a coup if it was someone you had actually heard of, or been to a movie that they were in. And the guys playing some kind of game I never understood with milk caps on the tables. Flicking field goals. I remember gazing in awestruck wonder at the amount of food on Tommy Prior's plate, and getting all bent over the fact that he could eat like that and stay skinny. Those cafeteria ladies loved Tommy Prior...Gosh...25 cents for all that food!! I remember that someone stole the quarters out of my loafers while I was in gym....man, was I offended! But I never left my loafers in the big locker again. Always locked them in the smelly little cubby we kept our stunning navy blue gym suits in. Those suits...wow...I remember being almost brought to tears the day one of the elastics in the legs gave up the ghost, and I had one droopy leg. Oh the humiliation! We had to run around the fenced area in full view of heaven-only-knew-who before we could shower and change...and like most 14 year olds I was positive that everyone was looking at ME. Of course now, I realize that probably not ONE other person who posts memories is going to say "Gee, I remember the day Sue Scriggins ran all the way around the outside of the field and her gym suit was flapping." I remember being required to make a jumper that you HAD to wear to school to get graded on...oh boy...it looked as if it had been put together by a committee with blindfolds on. It began a life long habit of mine of reading the instructions only when half way throught a project and stuck. (50% of the time I can put things together without reading the instructions..but not clothing!). And Dancing School...Miss Dot and Mr. Barclay....That pounding piano...Slide together slide...and the incredible shame of being left sitting around the edge of the room and having to dance with another girl...fighting over who would lead. Then watching June Valter and Richard Fox show us all how it should be done in assembly...Seta Boudikian playing Sabre Dance, Gay Cowan and Carol Meacham playing Rhapsody in Blue on two pianos...and our own Jane Ozenberger...gosh, some talented kids! Marie Nardiello, who sang better than Theresa Brewer any day..and Lulu McNair, a super voice not to be forgotten either. Because it was on my way home, I sometimes stopped at Zusi's Ice Cream Parlor...if I happened to be flush and have a quarter for a coke, which was not kept at my house. At the time I didn't appreciate the place, but looking back, it was a real classic, with marble counters and beautiful brass fittings on the soda fountain doodads, and those cool metal tables and chairs. And it smelled really nice....like chocolate and ice cream cones. And in senior year, I remember going to parties... At Fred Stauder's, and the justly famous ones at Louise Potter's. Her parents were saints!! Music cranked up and the floors bouncing almost like a trampoline to the beat of the Lindy Hop/Jitterbug. Rugs rolled up and every piece of furniture arrayed around the walls. What a great year that was...the last one before reality set in for many of us. Another quick memory...the class of '57 did some dastardly deed the night of their Senior Fun Day...or whatever it was called back then...and in assembly the next day, Mr. Gast(bless his heart and rest his soul), made the announcement that as punishment, WE would not be allowed a Senior Fun Day. Yes, yes....let the punishment fit the crime, I say! "...it has been so long since I have been back. I can trace my walk home...I remember some things about downtown...Hobby Hall...the Strand Theatre...I think there was a Lyric Theatre, too, but that is fuzzy. My Mom used to buy her meat at Muldowney's Market, and her dry goods at Cullis and Lewis, next door. Cullis and Lewis was so cool...there were interesting smelling things in barrels and gorgeous metal containers with slanty tops and Towle-type decoration on them for coffee beans and sugar. The floors were wooden, as were the counters. And the walls were lined with goods, and whatever you bought they put into a paper sack and carried it out to the car for you...or if there was enough, it went into a cut down box. They always called my mother by her name, and often gave me a piece of penny candy or a lolly pop. And there was a lady in a glass fronted office up near the ceiling at the back of the store...I always wanted to go up there and look down at the store and the people. I'm sure there had to be a staircase up to the office, but it was probably "in the back" and I never saw it. I used to imagine all sorts of ways to get up there...ropes, and elevators, and flying. There was a slanty ladder on wheels for climbing up to get things on top shelves, and I sometimes wondered if that was the way she got up there. As I look back, it was so old fashioned and wonderful. My own trips to the supermarket lack a certain cachet, and I would drop dead of surprise if anyone called me by name! Or carried my stuff out to the car, either. I remember Kress 5 & 10...Pierson's Hardware and the Summit Bank and Trust. Trost's Bakery...oh boy did they make great birthday cakes!! They probably make the icing with lard, but it was the best stuff I have ever tasted, and you can't find it anymore. No calories in it either...yum yum. Oh, how I remember my first day at SJH, a little gal in a large school, so very different from what I had attended in Maplewood from grades K-7. It was total culture shock and such a change for me; but I learned to adapt and fall in love with the whole ambiance of the magnificent school and education system. As I grew, not so much in height (ha! 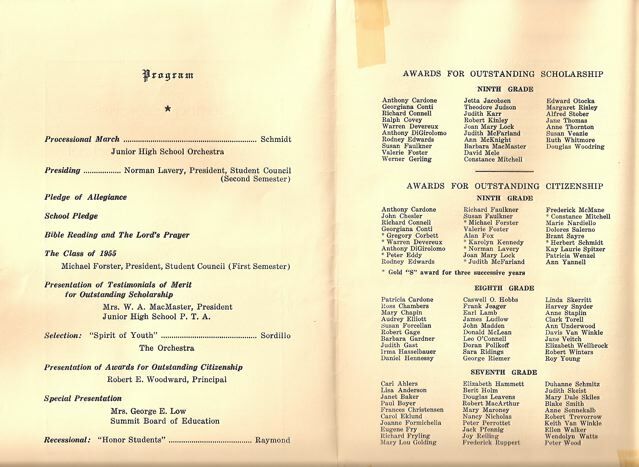 ), but intellectually and socially I came to cherish those years as being some of the best times of my formative life. I remember walking home from our JHS, which is now the Middle School, and forever getting lost on the way but I did get to see some beautiful sites in the lovely town of Summit. As with most (I think?) I had a new” best friend" just about every year, never forsaking the previous one; and at the same time maintaining my friends from Maplewood. Lynn Miller and I would exchange diaries each year and it was like looking at "Mutt and Jeff" walking down the center of town whenever we would be out and about. Great Gal that Lynn Miller! We practiced and practiced for cheerleading try-outs and didn't make it (oh, how I cried.) I never could master that cartwheel. I can remember being asked out on my first date and I immediately saying "no" because I believed that my Dad would not let me start dating in the 9th grade (horrors, and my how things have changed these days); only to find out that I could have in-fact accepted when I told my Dad a while later. The Parties in our finished basement designed and built by my brother, Nat, who was talented beyond his years and two years ahead of me in HS. We had the green lights inserted in areas of our lava rock bar (which he built) and under the bar top, plants hanging out (plastic of course). And who can forget dancing the jitterbug to those 45's and the pizza parties? As I look back I wish everyone could have come. I especially liked when my brother would have his "Royals" meetings down there and I could get a glance of those upperclassmen. What a great crowd they were and still are. Eastman’s, owned and operated by Russ Carter and his Mom, in the center of town where we would pick a 45 that we liked and listen to it in a booth or with ear phones and then decide if we wanted to make the purchase; some of which I am sure are on the Jukebox in our Website. The great music of the fifties!!! The safe and fun "hang outs" for us young teens after school to have a vanilla or cherry coke, pile in a booth and talk and talk and talk. The Seligman's, Bob and Norma, who owned the Snack Shop next to the Strand Theater (which is now the Strand Mall! ); they would listen to our problems (what we thought at that time were problems) and had sensible and caring parental advise. Two very sweet people whom I cherish to this day and now reside in Florida. The "snowstorm" on April 5th after a dance the seniors had attended and my dear Mom opened our house for the couples who were gathering here to sleep over throughout our ranch home so they would not have an accident on the snowy roads. Those were some of the fun times to a little sophomore such as me. Kenny’s Drive-in and Car-Hop on Morris and Essex Turnpike were we would go and hope to see some other friends out cruising around. My first car, a little green Hillman Minx which had an Ajax can as part of the engine, clutch on the floor and signals that flipped out of the driver’s side window. When we would go around the corner in it the passengers would have to lean away from the turn to balance the wheels. All such clean and innocent fun we had! Oh, how we laughed…we were too young to be scared. Take me back to the Fifties! The memories are just too numerous, so I won't bore you by going on and on; but if you come to our fiftieth, perhaps at one of the functions we can remember together. 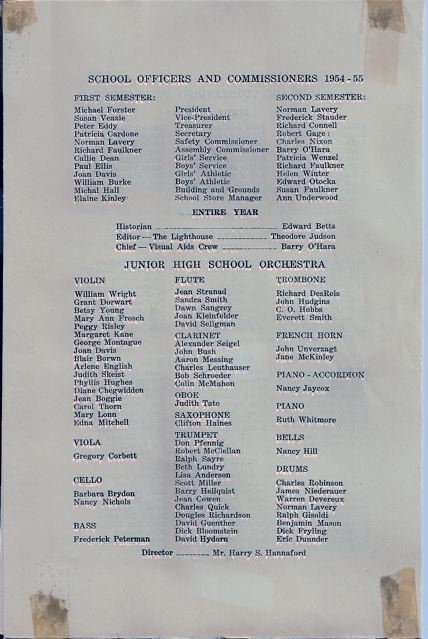 The 1951-1952 school year was a fabulous experience. It brought significant changes. There were two sixth grade classes at Brayton School. 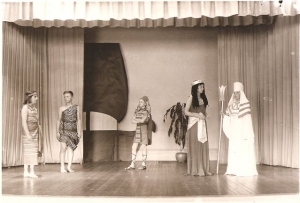 The teachers, with the principal’s permission, allowed the students to make a project, lasting almost the entire school year, out of the opera “Aida” by Verdi. Of all my learning experience in school, this was one of the most significant. In order to give the best performance possible we had to learn about history, opera, music, costume making, stage presence, etc. We studied ancient Egypt extensively. We went to the New York Metropolitan Museum of Art to see the displays of ancient Egypt. The mummies, of course, were fascinating. I would be willing to bet that the teachers even worked the ancient theme into our spelling lessons. To help us to appreciate “Aida” we were taken to a matinee performance in New York City. It was back in the days of the old Metropolitan Opera House. The theater was very ornate with lots of gold and burgundy. 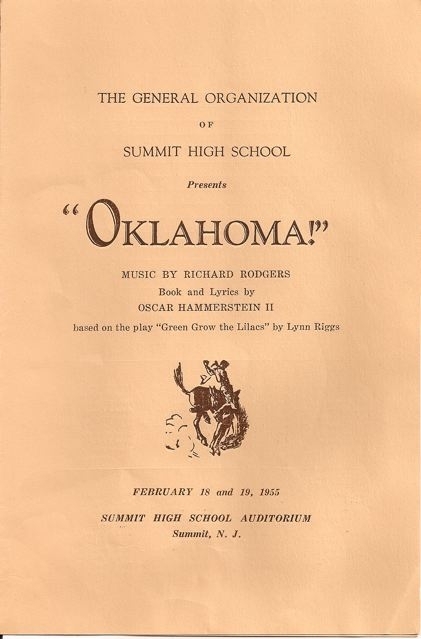 The pageantry and magnificence of the music, costumes, and sets made lasting impressions on me. It was magnificent! Our costumes were home made, as were the sets. The music was geared to us. After all, we were only eleven and twelve year old kids. I was one of the priestesses, as was Susan. White slips made good costumes with appropriate trim added. To this day I can’t think of a better way to study another time and culture in school. We also learned that not everyone approved of the project. While there were some very favorable letters to the local weekly newspaper, as many or more were quite negative. “How could such young children comprehend sophisticated subjects? How could religion become a matter of controversy?” The latter occurred because the girl chosen for the lead role in “Aida” was a member of _________ Church. Her folks had reluctantly agreed to allow her to participate as long as there wouldn’t be a lot of publicity. Well, there was an inordinate amount, which drove her parents to remove her from the opera. Fortunately her replacement, Kathy Sharpe, a good friend of mine, handled the pressure and the role well. But it was a huge lesson. 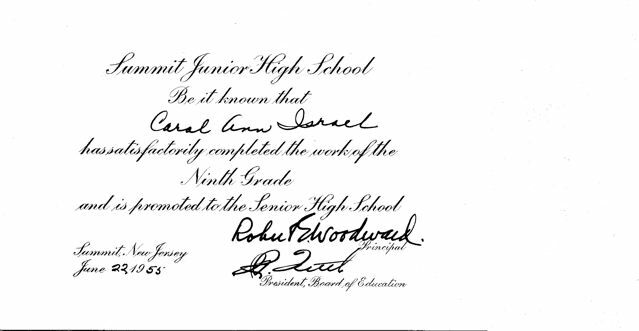 I came to Summit High from Rutherford schools, where I’d been with the same classmates for 12 years, K-11. You’d probably all know Rutherford now, or E. Rutherford really, as the location of Giant’s Stadium in the N. J. meadows. 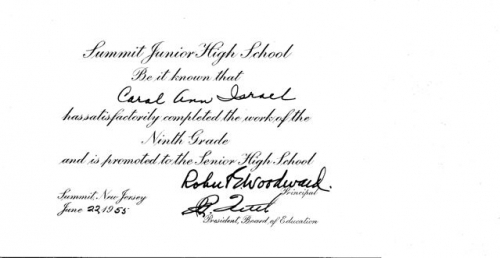 It was a tough transition for one’s senior year to a better, academically more challenging, high school. One act of kindness by Don Marcy remains etched in my memory for all the 50 years. We were short of lockers and the “new kid” didn’t have one assigned when he showed up for Homeroom. Don immediately said “I’ll share mine” and we did for several days until an unassigned locker was located. Don, I’ve told this story a hundred times as an example to colleagues and friends, about a seemingly small act of kindness done to this scared and awkward “new kid” that so much helped him (me) get through those first few days. “Thank you Don” in case I never took the time to say thank you before. I dated Phyllis Guest for most of our senior year and off and on for several years thereafter. I was deeply saddened to see her name “in Memorium.” She was quite the drum majorette and quite a lady. For some reason she hated to be called Phyllis. She wanted to be called Phyl and doubtless would want to be remembered that way. Marilyn Benner, what a terrific athlete, when female athletes were not quite “in fashion.” We went on to Springfield College where Marilyn starred in many sports, especially field hockey. She died way, way too young. Thanks to the baseball team that accepted me. You found a place for this “outsider” who had starred in the NNJIL, but as a senior pretty much warmed the bench for a strong, well established high school team. You were friends! Then there was our senior class musical, Where’s Charlie? Never before or since have I been more frightened than singing a couple of solo numbers. One other “thank you” to Nancy Casebolt, for getting me through Spanish 2. 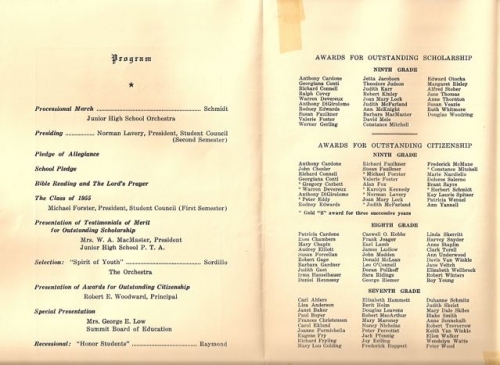 I’m not sure, after 50 years and just that one senior year I’ll recognize any of you, but what the heck, how many 50 year H. S. reunions does one have anyway? See you, with my wonderful wife Mary Estelle, in October! Do you remember Sloppy Joes? The real ones and not that hamburger glop? 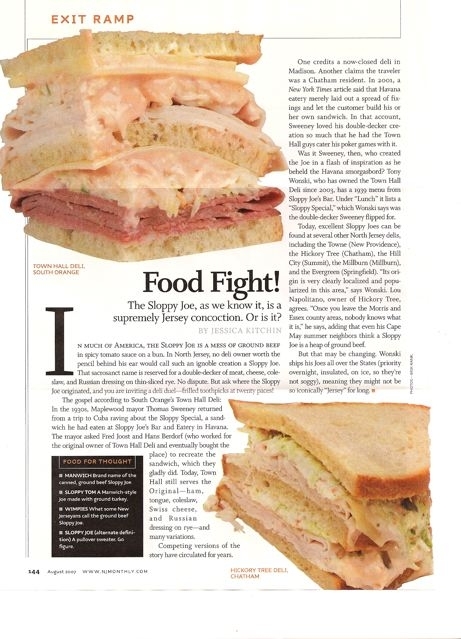 Here is an article courtesy New Jersey Monthly Magazine. Did any of you have these too? The Student committee which is investigating cheating has estimated that perhaps 10% of the students at Summit High School are chronic cheaters. Another 10% never cheat. This leaves an estimated 80% who cheat occasionally. The committee feels that the answer to this problem lies with the parents, faculty, and students. Parents must realize that home attitude toward cheating has a direct influence on the behavior of their children. The student who hears his parents bragging about “putting one over”. If a parent writes a false excuse for an absence which would not otherwise be excused, he is actually helping to cheat. Parents should be practical in their demands on a child. Often a student feels it beyond his capacity to handle the courses and number of majors necessary to get him into a “good college,” and believes that he must get good marks at any cost. If parents think that their child is not working up to his capabilities, it might be well for them to find out whether they are justified in expecting better work before demanding better marks. On the other hand, the parent who shows too little interest in his child also adds to the problem. Because the student thinks no one cares, he may take the easy way out and cheat. A list of recommendations has also been sent to the teachers. It includes the following suggestions: Staggering long term assignments, outlining daily assignments in advance, periodically teaching good study habits, enforcing rules concerning cheating, and most important, creating a good moral climate in the classroom. But the students themselves can do the most to eliminate cheating. Since we have asked for long term assignments, we must cooperate by planning our time and by eliminating excessive extra-curricular activities. We must realize our own abilities and limitations, and not take a course which would necessitate cheating in order to pass. We must realize, also, that we are only hurting ourselves when we cheat, because after high school we will not have the basic knowledge expected of us. We will have to develop enough will power to resist the easy, but dishonest way of doing our work. To do this, we need your help. Finally, the point which the committee feels is the crux of the whole matter is to get the student to think about cheating. If the majority of the students think about this problem and discuss it, they will have a different attitude toward it. They will see that cheating is morally wrong, that it is really a form of dishonesty. On a problem like this student pressure and student opinion are very powerful forces, but we need the help of parents and teachers. No one can feel complacent, we all have a responsibility.